Back in the day, disasters – like oil spills or rivers catching on fire or chemical plants blowing up or toxic waste disposal – used to prompt governments to respond and take steps to strengthen laws and regulations to prevent a recurrence and protect the public. But more recently – perversely – right wing forces have seized the initiative, and used crises as opportunities to attack and rollback government and regulations, while advancing a corporate agenda of privatization and deregulation. At the most chaotic juncture in Iraq’s civil war, a new law is unveiled that would allow Shell and BP to claim the country’s vast oil reserves…. Immediately following September 11, the Bush Administration quietly out-sources the running of the “War on Terror” to Halliburton and Blackwater…. After a tsunami wipes out the coasts of Southeast Asia, the pristine beaches are auctioned off to tourist resorts…. New Orleans’s residents, scattered from Hurricane Katrina, discover that their public housing, hospitals and schools will never be reopened…. These events are examples of “the shock doctrine”: using the public’s disorientation following massive collective shocks – wars, terrorist attacks, or natural disasters — to achieve control by imposing economic shock therapy. Well, DEP Commissioner Bob Martin obviously got the Milton Friedman memo and understands the “Shock Doctrine”. The “Frankenstorm” should be a teachable moment to show how “extreme weather” and lax regulations of greenhouse gas emissions and coastal over-development have put thousands of people and billions of dollars of property in harms way. The storm should be a clarion call for finally addressing the rising global warming crisis. But instead of that teachable moment and reform opportunity, Martin is shamelessly using the oncoming “Frankesnstorm” as cover to promote the upcoming weakening of DEP flood hazard/stream encroachment regulations. getting out in front of the controversial upcoming debate on weaking stream encroachment regulations. But not surprising after a year of denial about record temperatures, wildfires, drought, and extreme tornadoes and thunder storms. 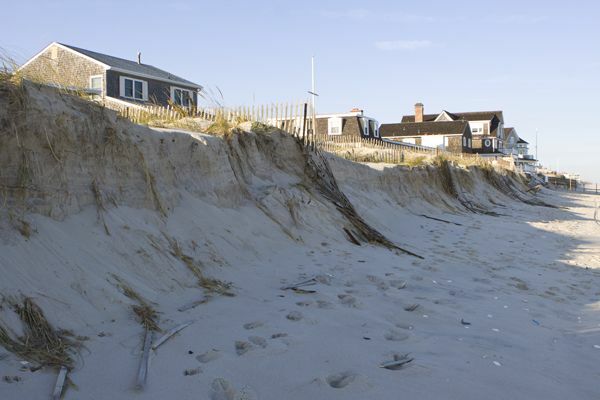 As DEP prepares for potential statewide impacts from Hurricane Sandy, I wanted to remind you how you can help mitigate impacts in your own town and assure you that DEP is here to assist you however we can. First, we recommend picking up as many leaves off the ground as possible, running your street sweepers, and ensuring that storm drains are stormwater basins are clear of any debris. Please also advise your residents to pick up leaves and any other debris from their own property. Second, if you need to remove any trees, debris or other obstructions, including shoal dredging, from streams to prepare for this storm, you can conduct those activities without contacting DEP if you follow the guidelines athttp://www.nj.gov/dep/landuse/download/fh_012.pdf. If you need to do other activities that do not fit these guidelines, please call us and we will make every effort to work through any issues with you over the phone. In most cases, all we need is notification of what you are doing on an emergency basis. You can contact us about your projects or with any questions you may have by calling Nabil Andrews or Tina Wolff, DEP engineering and environmental staff dedicated to stream cleaning projects, at (609) 633-6563. Moving forward, DEP will soon be proposing regulatory changes to make it even easier for you to maintain streams and ease any flooding in your towns, including broader Permits By Rule, automatic authorizations if the Governor or FEMA declares a State of Emergency, new General Permits and simpler Individual Permits. We are compiling in one place on our website information and resources to help get you through the storm from a DEP perspective. I will email you again on Friday with the link to the Hurricane Sandy information that is being added to the DEP homepage at nj.gov/dep, and we will continue to add to that site any new information you might need. As always, DEP’s emergency responders are on call 24/7 to manage any spills or discharges or other incidents that may impact the environment. Anyone who experiences or observes an incident should call the DEP hotline: 1-877-WARN-DEP. Well Marty, people don’t necessarily need to agree to “retreat”. Reality has a way of intruding – a major storm just might make relocation decisions for them. have been writing about this for years now. The standard scientist answer is “you cannot blame a specific weather/climate event on global warming.” That answer, to the public, translates as “no”. However, if the question were posed as “would these events have occurred if atmospheric carbon dioxide had remained at its pre-industrial level of 280 [parts per million] ppm?”, an appropriate answer in that case is “almost certainly not.” That answer, to the public, translates as “yes”, i.e., humans probably bear a responsibility for the extreme event. In either case, the scientist usually goes on to say something about probabilities and how those are changing because of global warming. But the extended discussion, to much of the public, is chatter. The initial answer is all important. Although either answer can be defended as “correct”, we suggest that leading with the standard caveat “you cannot blame” is misleading and allows a misinterpretation about the danger of increasing extreme events. …in certain instances, structural engineering solutions will not be practical or economically feasible. In these cases future public and private development and redevelopment must be directed away from the hazardous areas. While some derogatorily refer to this option as “retreat,” from the perspective of sound planning based on the best available science, the concept actually involves “strategic adjustment.” Prudent planning requires that we expand upon the existing studies of the societal, economic, and environmental costs of possible mitigative actions while the greatest number of alternatives exist. [Update #1 – we’ve previously severely criticized DEP for failure to plan and prepare for coastal storms and for delegating responsibility to local government, so not surprisingly DEP is getting “out in front” of the storm. But they are focusing on and doing the wrong thing! DEP says nothing about global warming, climate change adaptation, or limiting development in hazardous locations! Is that actually provable, or is it more a matter of extrapolation and conjecture, however logical? What’s the scientific basis? Do you have reports/data/etc? Any scientists willing to discuss and confirm? The general theory is that global warming increases air, land and water surface temperatures, which increase atmospheric moisture content. Warmer, wetter air results in more precipitation. Warmer air and warmer ocean temperatures increase the energy of storms. Storms therefore become more severe and frequent. It is NOT conjecture or speculation, but it is science, statistics, and modeling. I am not familiar with scientists willing to go on the record on this. DEP Commissioner Bob Martin - DEP Mission and "culture" need to change to promote economic development and treat business like "customers". Our recent accountability project: “Taking a Closer Look at Christie DEP Changes” was dealt another setback today, when DEP again denied access to public records of the new Office of Dispute Resolution. It is shocking that DEP feels that they can create an accountability free black hole, particularly given the significant role of the Office in environmental regulation and enforcement of environmental laws. There is no mention whatsoever of the public in these important negotiations and “lines of communication”. I guess it is clear who DEP is serving and who their “customers” are. Obviously, that Office has the potential to became a back door for secret deals that compromise enforcement of environmental laws. To prevent that kind of abuse, that Office requires robust transparency measures to prevent obvious potential abuses, which environmental critics have described as “Let’s Make a Deal”. The Office was originally created back during the Whitman Administration (1994 – 2001), when Governor Whitman installed a personal crony – her college roommate – to head the effort. The Office was designed to implement Whitman’s “Open for Business” policy and was a key component of her DEP targeted “Strategy for Regulatory Reform” (STARR). The Whitman “Open For Business” policy was exposed as a attack on the environment in an award winning investigative journalistic series by late reporters Dusty McNichol and Kelly Richmond, formerly with the Bergen Record. In 2002, the Office was abolished by Gov. McGreevey’s DEP Commissioner Brad Campbell, who agreed with environmental advocates that the Office was inherently flawed, lacked transparency and accountability measures, undermined strict enforcement policy, and was prone to abuse and back room deals driven by politics and undue influence of special interests. Under Governor Christie, the slogans have changed but the underlying [pro-business – anti-regulatory] policy remains the same. Whitman’s pro-business rollbacks – under the guise “regulatory reform” – have become even more explicitly an attack on regulation and expansive effort to promote “regulatory relief“, under the guise of reducing “job killing red tape“. As part of that Christie “regulatory relief” policy, DEP Commissioner Bob Martin restored the Whitman Office. Commissioner Martin aggressively promoted his rollback “transformation” agenda, in DEP press releases (e.g. like this and this) and with outreach to the business community. The Department recognizes that if changes are to be made, they need to be made early in the Administration. Time will tell whether the NJDEP can actually “transform” itself into a more user-friendly and service-oriented organization or whether it will simply be business as usual. We are seeing some positive signs. 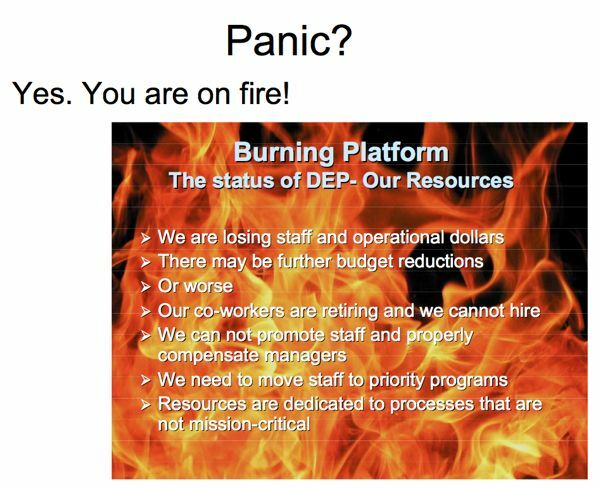 Long term DEP career middle managers described it as the “New World Order” at DEP. Who is that Office meeting with? What are the regulatory and enforcement disputes they are negotiating? What are the outcomes of these negotiations? What is the effect on the environment and the integrity of the enforcement program? Why is DEP denying OPRA records requests for this information? Are there any real investigative journalists still working in NJ? We’ll keep you posted – no way DEP can get away with this OPRA abuse. I request public records of the Office of Alternate Dispute Resolution, including: 1) participants in the program, including cases/disputes handled; 2) the administrative record of each case, e.g. all documents submitted as part of the dispute; 3) the disposition of cases/outcomes of the dispute resolution process; 4) Reports and/or records generated by the Office, including memoranda, case summaries, emails, phone logs, meeting logs, meeting notes, and phone logs (sic) regarding disputes brought to the Office. Addendum Disposition Notes: This request has been denied on the basis that the request is overly broad and of the nature of a blanket request for a class of various documents rather than a request for specific identifiable government records, thereby being an invalid OPRA request (See Gannett NJ Partners v Middlesex, 379 NJ Super 205, 212 App Div 2005). In addition, OPRA does not require the NJDEP to conduct research & correlate data pursuant to N.J.S.A. 47:1A-9 & Mag Entertainment v Div of Alcoholic Beverage Control 375 NJ Super 537 (App Div 3/05), Bent v. Stafford Police Dept 381 NJ Super 534 (App Div 2005), and GRC Decision in Asarnow v Dept of Labor & Workforce Development, GRC Complaint # 2006-24 (May 2006). The NJ Open Public Records Act (OPRA) gives public agencies 7 working days to respond to records requests, but it sure didn’t take DEP that long to deny my recent OPRA request for records on the new DEP Office of Economic Analysis. DEP denied the request in less than 24 hours! Second, DEP Commissioner Bob Martin has mandated that DEP’s Mission be expanded to include “promotion of economic development”. Presumably, the Office of Economic Analysis would play a lead role in that effort. Third, DEP Assistant Commissioner Siekerka just bragged that the Office reviews virtually all DEP policy and regulatory initiatives, so it is crucial to understand what that Office does and how it relates to environmental policy and decisionmaking at DEP to implement NJ laws. I filed the OPRA request after learning that DEP Assistant Commissioner Siekerka praised that Office and its Director, Ben Witherell, in a speech on Saturday at the ANJEC Environmental Congress. That sure takes some arrogance! – trot out a DEP Assistant Commissioner to publicly tout the work of a new Office they created, and then deny a public request for records of the work of that Office! The DEP website provides no Mission statement or other description of the duties and responsibilities of that Office. I contacted the Director of the Office, Ben Witherell, to ask for information and Ben replied that I should file an OPRA request. Ben copied the DEP OPRA Office Manager. Most often we provide assistance to the program staff responsible for the rule. The analyses our office conducts or assists with relevant to rulemaking and Executive Order #2 is contained in the “Economic Impact” section of the rule itself when it is published. If you need assistance with finding this information please contact Mr. Matthew Coefer of our OPRA office, and copied here. Thanks Ben – I’ve already filed an OPRA request. Please allow me to clarify my request – are you suggesting that your Office only gets involved in the “economic impact” of proposed DEP rules? I was under the impression that virtually all DEP policy and program initiatives were within the scope of your Office (as well as economic view or rules pursuant to EO #2). Just two examples of projects I have been involved with: Barnegat Bay Management Plan and lease valuation of state lands. Also, based on your response, I will assume that there is no formal policy and procedure, methodology, Guidance, or mission statement for your Office. Please correct me if my assumption is wrong. The DEP’s Office of Economic Analysis – conceptually – serves a similar role and performs similar functions in the regulatory arena as the federal Office of Management and Budget Office of Information and Regulatory (OIRA). OIRA tends to use “cost benefit analysis” and other economic tools to delay, weaken and even kill regulations designed to protect public health and the environment. So its controversial work receives strict scrutiny and comes under regular strong criticism from environmental and public interest groups, like OMB Watch. However, OIRA at least operates somewhat openly and transparently – there is a website, federal law and Executive Orders that govern their work, and there are basic document disclosure and other accountability measures to provide some transparency of the work they do. In contrast, the DEP Office of Economic Analysis is a black hole. The Office is NOT authorized by any act of the Legislature. Yet it has a significant role in using economics to interpret and apply environmental laws, sometimes in ways that contradict the standards in the law or otherwise conflict with legislative intent. There is no openness or transparency – no website, no mission statement, no policy and procedures, no public review or participation, and no disclosure of the intervention of the Office in various DEP functions. And now DEP has just confirmed that. So, just what are they doing in that Office? We will get to the bottom of this one, even if it takes a litigation crowbar. 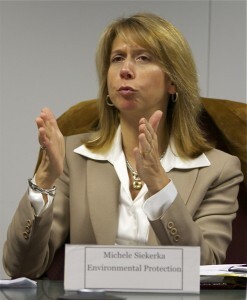 According to DEP website and public remarks of Assistant Commissioner Siekerka on 8/20/12, the DEP’s Office of EConomic Analysis is tasked with conducting “cost benefit analysis” of agency policy and regulatory proposals. 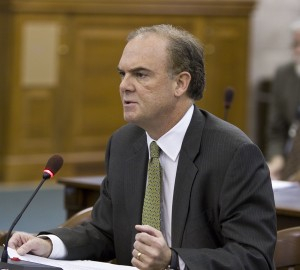 I request copies of all public records of the Office of Economic Analysis, including: 1) all cost benefit analyses conducted; 2) all comments and records regarding the Office’s review of DEP policy and/or regulatory proposals, including Reports, written comments, emails, meeting logs and meeting notes; 3) all documents authored by and emaisl of Ben Witherell, Director of that Office, regarding review of DEP policy and/or regulatory proposals.